Elsie Vredenburg is probably best known for her pictorial pieced quilts, which are often combined with elements of traditional patchwork designs. She prefers piecing to applique, so she has developed a method of designing in which all elements of the design are converted to straight lines. This makes for somewhat of an angular look, which is characteristic of her pictorial quilts. Subject matter ranges from architectural to people to the animal world. Elsie’s quilts have appeared in many national and international quilt shows, including American Quilter’s Society, National Quilting Association, National Patchwork Association, Quilt Expo Europa, Quilters Heritage Celebration, Quilt America!, International Quilters Association. They have also appeared in Quilters Newsletter Magazine, Lady’s Circle Patchwork Quilts, Quilting Today, and Traditional Quiltworks. Her article, “From Photo to Fabric: Pieced Architecture” was published in the Spring 1996 issue of The American Quilter Magazine. Elsie is a native of Michigan. She received her BS in Home Economics Education from Michigan State University in 1963, and taught Home Economics at the high school level for a few years, then decided it was more important to stay at home with her young children. Her quilting career began at that time as a way to add a little bit to the family income while staying at home. 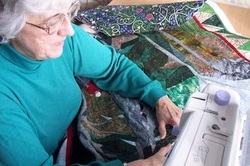 She learned to quilt while still in high school, at the insistence of her grandmother. “I quilt because I love fabric in its many colors and patterns, and I love cutting it up and sewing it back together to make new designs. Even though I always said I had no artistic talent (translation: ability to draw) and avoided art classes every time I could, I think deep in my heart, this is what I always longed to be able to do. I make quilts for enjoyment, both mine and others’. If I like a quilt when it is finished, I am happy. If others like it, too, I am happier. Post by Quilts by Elsie.